One of the primary factors in getting a good night’s sleep is your choice of pillow. 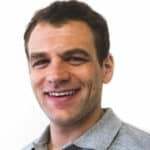 Many people spend a lot of time reading mattress reviews to find the perfect mattress, but then assume any old pillow will bring them nighttime bliss. But just like with mattresses, when it comes to pillows, you often get what you pay for. Spending a little bit more on a quality pillow – including those with longer-lasting fills such as buckwheat, latex, or down – could be the last part of the good night’s sleep puzzle you’ve been searching for. Slumbr is a company focused purely on pillows at this time, and I wanted to see if their products lived up to the hype. The company has several options in their pillow menu, but today let’s look at three in particular: the Virgo pillow, the Orion pillow, and the Vela pillow. Keep reading for our Slumbr pillow reviews, or click here to slide down to our review summary if you’re in a hurry. 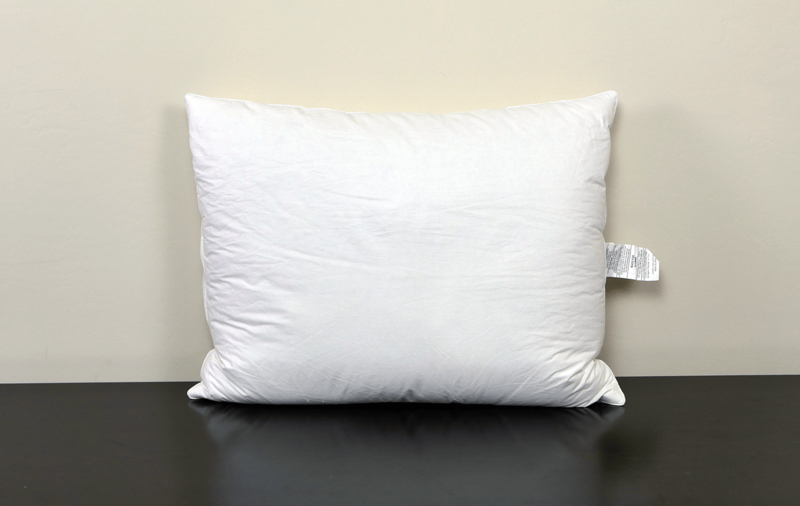 The Virgo pillow is one of Slumbr’s down pillow options, filled with 12 ounces of 550 fill power duck down. It is soft and sleek, but not overly full like some down pillows. As a comparison, Slumbr’s other down pillow uses 20 ounces of down, so the Virgo pillow is much thinner, which makes it ideal for stomach sleepers. According to Slumbr, the down used in the Virgo pillow is responsibly sourced and cleaned in a sustainable manner, so you can feel good knowing you’re purchasing a quality product in that respect. 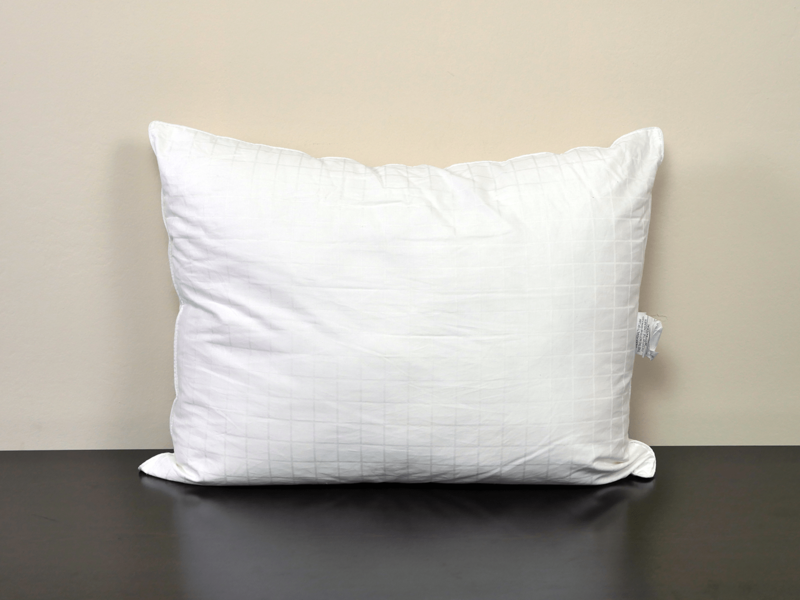 The cover of the Virgo pillow is plain white and fairly basic. Made from 400-count sateen cotton, it is soft to the touch. It’s also 100% down-proof, which means it acts like a barrier to help keep the down feathers inside (and not poking you in the eye). The cover is simple, but seems durable without sacrificing softness. 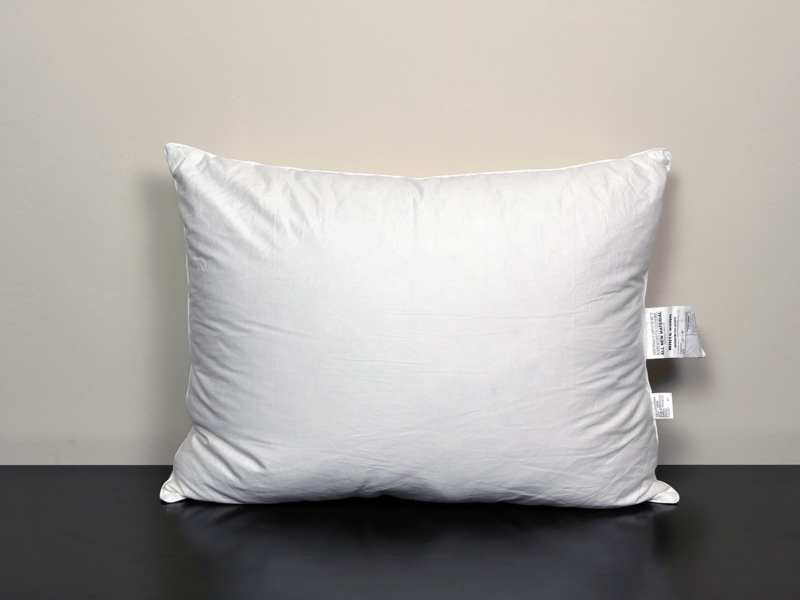 The thin construction of the Slumbr Virgo pillow makes it a nice option for stomach sleepers. It’s pretty scrunchable, which means you can make it a bit thicker in certain areas if you choose. It’s been my experience that thin pillows will often cause my head to sink throughout the night till I’m nearly lying flush with the mattress. The Virgo pillow does thin out when you’re sleeping, but because of the loft quality of the down, my head didn’t sink in the same way as with other thin pillows. However, if you’re a stomach sleeper who likes a firmer pillow, the Virgo pillow from Slumbr isn’t for you. It doesn’t provide a ton of support like a thicker pillow might, so be aware of your preferences before purchasing. Surprisingly, this pillow can work for back and side sleepers too. My wife found it to be supportive if she “doubled” the Virgo pillow by tucking it underneath itself. She didn’t wake up with a crick in her neck like she often does with thinner pillows. In addition, it could possibly work well for secondary uses, such as behind the back or between the legs. Regarding breathability, the Slumbr Virgo pillow ranks somewhere in the middle. I didn’t wake up overly hot, but I also have slept on cooler pillows. If you live in a warm climate and this makes a difference to you, you may want to check out pillows specifically designed with cooling in mind. 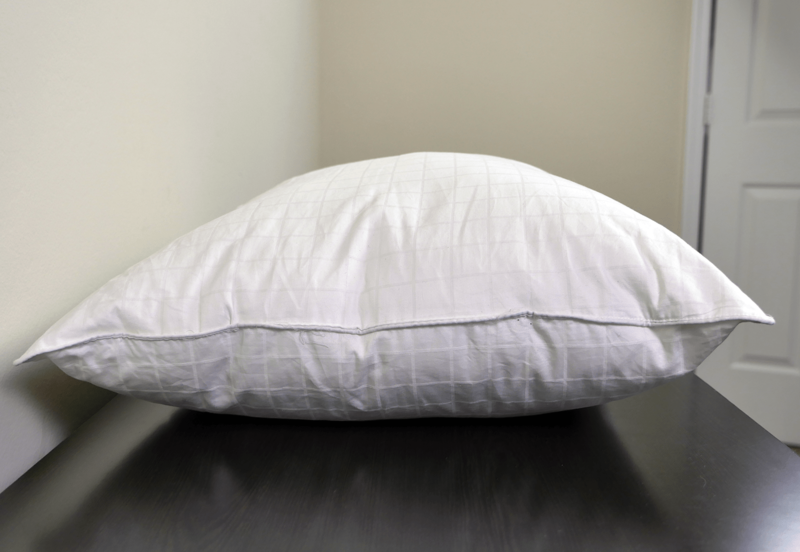 The Orion pillow is Slumbr’s hypoallergenic option for those with allergies who can’t tolerate down but want a similar feel. It is filled with a polyester gel microfiber, so it’s a step up from cheaper polyester pillows that might not last as long. Essentially, this is Slumbr’s “everyman” pillow, designed to suit most sleepers’ needs without being overly complicated. The Orion’s cover isn’t anything to write home about, but it seems fairly well constructed and it’s 100% down-proof. Made from 300-count damask cotton, it’s definitely not as soft as the Virgo pillow. However, while the Vela and Virgo pillow covers are plain white, the Orion has a white checkered pattern that adds a little bit of style. Down alternative pillows are often inconsistent, and the Orion is not. It remained fluffy throughout the night and did offer some support. However, the Slumbr Orion pillow is not as moldable as others and I did feel like it had more sinkage. In addition, I woke up hotter with the Orion pillow than with Slumbr’s other options. All in all, I wouldn’t recommend the Orion for stomach sleepers unless you prefer a fairly thick pillow. My cousin Chris, a side sleeper, thought it worked well if he curled the corner of the pillow underneath to create a bit of extra support. My wife thought it worked all right as a pillow for a back sleeper, but she’s definitely had more comfortable nights of sleep with different pillow options. The Orion pillow by Slumbr is a solid all-around option if you’re looking for a less expensive pillow that’s of slightly higher-than-average quality. Otherwise, I’d spend the extra money to find something that works just a little better for your specific sleeping preferences. If you’re searching for the kind of luxury pillow you might find in a hotel, the Slumbr Vela pillow is a nice choice. It is currently the company’s only option constructed of both feathers and down. The 24 ounces of feathers are inserted into an inner pocket and then encircled by an 8-ounce layer of 550 fill power duck down. The way the down surrounds the feathers creates a unique feeling of support at the core, with fluffy and consistent softness that’s missing in other feather pillows. 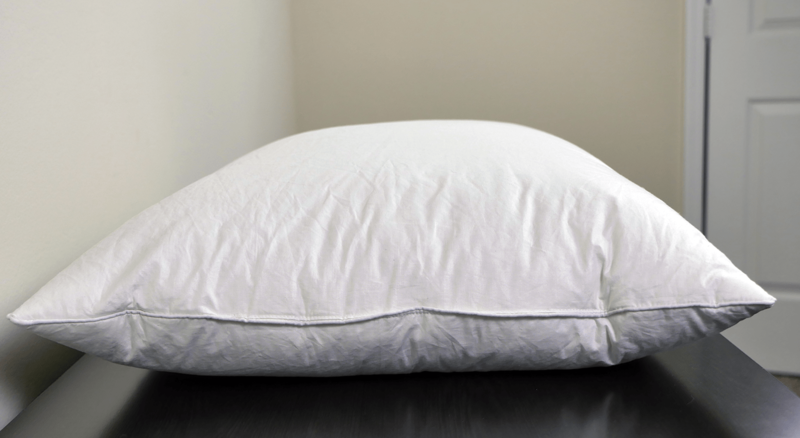 Like the Virgo and Orion pillows, the Vela pillow from Slumbr comes with a cover that is 100% down-proof. It’s made from 300-count damask cotton, which, combined with the thickness of the pillow, makes it sleep slightly warmer than other pillows. That said, it is not a hot pillow by any means. I found the Vela pillow to be more supportive than the Virgo and Orion pillows, and that’s likely due to the hefty feathers in the center of the pillow. It is firm but has some give, and it held its form throughout the night. However, the Slumbr Vela pillow was also moldable (though not nearly as moldable as the Virgo pillow), so if you’re a side and stomach sleeper, you can easily scrunch the pillow to get comfortable in each position. Slumbr actually doesn’t recommend this pillow for frequent back sleepers, since pillow compression can put pressure on the back of the head instead of offering appropriate support. A lot of feather pillows are lumpy and sleepers complain about feathers poking them throughout the night. Thanks to the Vela pillow’s design, I didn’t feel the individual feathers at all, as they worked as a cohesive unit to provide support and comfort. The Vela pillow by Slumbr is thick and not super breathable, but surprisingly that didn’t make it overly warm. In fact, this was my wife’s favorite pillow of the three. Which version of the Slumbr pillow should I buy? All three Slumbr pillows I reviewed are well made and are strong competitors at their price points. However, you’ll want to choose your pillow carefully depending on your individual preferences. The best way to choose is to simply use Slumbr’s pillow quiz, which can help you determine the best choice based on your specific needs and desires. Sleep on their stomach – the small amount of down stuffed into this pillow is great for those who desire something scrunchable and flexible under their heads at night. Prefer a thinner pillow – this pillow doesn’t provide a ton of firm support, but it’s thin and moldable. Don’t mind spending a little more – at $125, the Virgo pillow is the most expensive of the three options (though not the most expensive in Slumbr’s pillow menu). However, given the quality of materials used in the filling and cover, the pillow seems appropriately priced. For more information and to check it out, visit Slumbr.com. Sleep on their back or side – this pillow was created to be versatile and to appeal to any buyer, regardless of sleep position (even stomach). So if you tend to shift between positions during the night, this would be a nice choice. 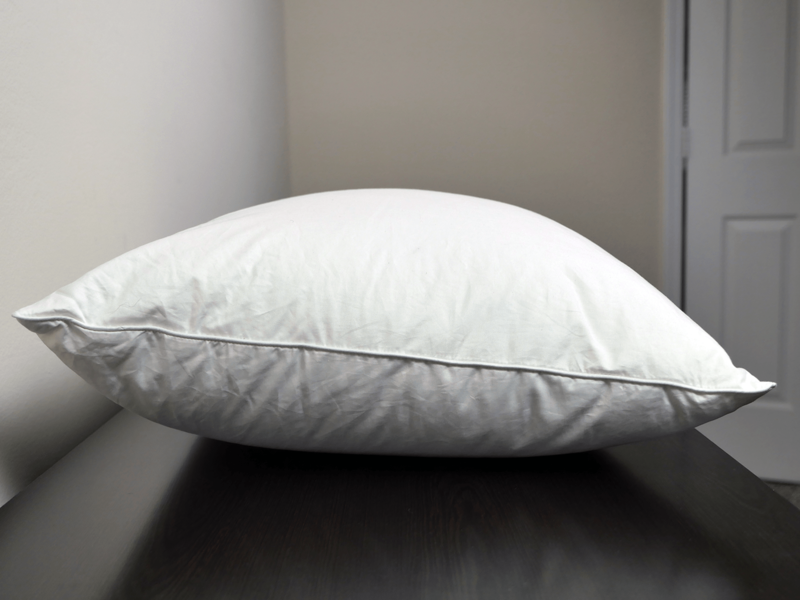 Have allergies – the Slumbr Orion pillow is hypoallergenic, so you can use it if you’re allergic to down, but love the way a down pillow sleeps. Want a less expensive, but quality option – looking for a great down alternative that won’t break the bank, but might last a bit longer than the average pillow? The Orion pillow could be your perfect solution. Sleep on their side – the level of support and scrunchability make the Vela pillow by Slumbr a nice option for side sleepers (and even the occasional stomach sleeper). Prefer a thicker pillow – the most supportive pillow of the three, the Vela is thick without being overly plump. Like the feel of down, but the support of feathers – thanks to the Vela pillow’s unique design, you can have both. 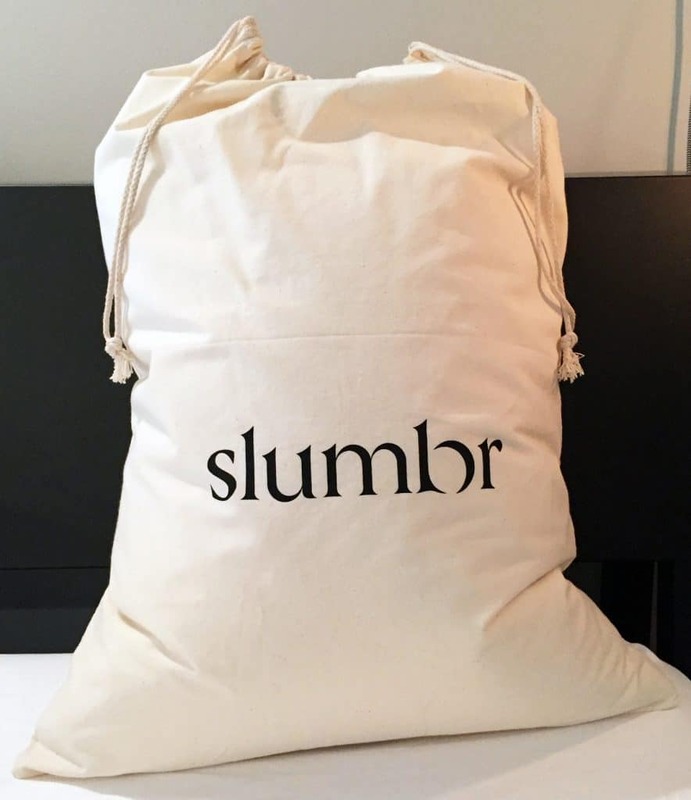 The Slumbr pillow series is one that should not be overlooked. With so many different options, it’s really hard to go wrong with Slumbr. Prior to purchasing a pillow, you have the chance to take their sleep quiz and see which model is most appropriate for you. After reviewing the Virgo, Orion, and Vela, it’s safe to say Slumbr takes pride in creating pillows for each sleeping style. The balanced levels of comfort and support these pillows offer is quite good.